SAMSI has been trading for 21 years, specialising in Japanese cuisine and food stuffs. It began as an award-winning restaurant, which quickly expanded into four different cities in the North West of England. 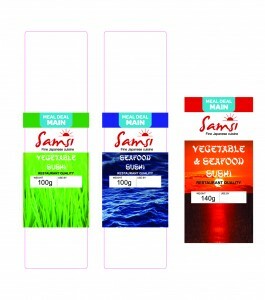 Samsi currently have a large Japanese supermarket which they sell a range of food stuffs including their own restaurant quality meal deal. We were contacted by them who were struggling to get their labels produced efficiently by their current supplier. Therefore, we proudly designed and produced new labels for their meal deal. Samantha Gore from Samsi was particularly pleased that we met all the deadlines and she described the experience as ‘fun’ and stated that all staff from Positive ID were very friendly and happy to help. Also, she thanked us for our patience with all the refinements she desired.